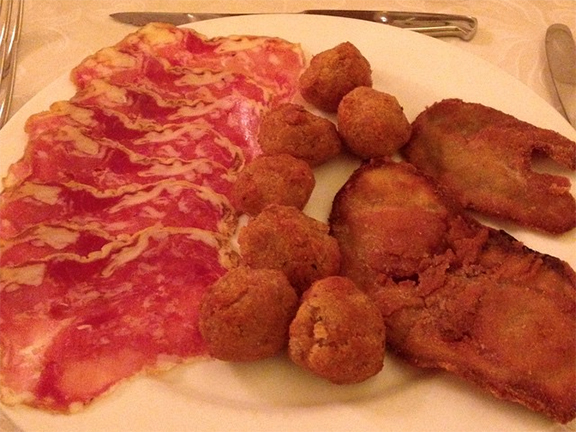 Above: Salumi with fried meatballs and fried eggplant at Locanda La Torre. One of the cool discoveries for me during my recent “week in Franciacorta,” was the super old school Locanda La Torre. There are so many great places to eat in Franciacorta but they kinda tend to lean on the frou-frou chic side. There’s nothing wrong about that. But sometimes you just want to hang at a chill location and just munch down on some good grub. Locanda La Torre is that place. When I visited for dinner, it was all locals eating there and there were a ton of people just hanging out at the bar and outside. The only bummer was that I was with a friend/colleague who doesn’t eat meat. Not that it was a bummer to be with her. But when I saw the steaks come out from the kitchen, I wished they would have saved a porterhouse (Fiorentina, as it is known in Italian) for me. Most Americans think of Tuscany as the best place to eat beef in Italy. But, I swear, the best beef I’ve ever had in Italy has been in Brescia province and Franciacorta. And I’ve spent a lot of time in Tuscany. The meat market of Rovato (a township included in the Franciacorta appellation boundaries, although not entirely) was once one of the major hubs for beef in Italy. And today, there is still a grand tradition of high quality beef throughout Brescia province. And this comes from someone who has lived in New York and now lives in Texas, places where beef is a prized dish. Next time in Franciacorta, when you want a relaxed evening without any pretense, have dinner at La Torre. I’ll see you there… and I’ll split a porterhouse with you!